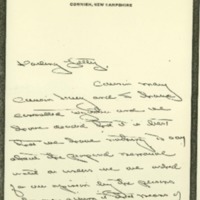 Margaret writes to Jessie about plans for their mother’s memorial and her new role as White House hostess. Cousin MaryCousin Lucy and I have consulted together and we have decided that it is best that we have nothing to say about the proposed memorial until or unless we are asked for our opinion by the persons who are giving it. That means of course by their representatives. If I were you I would tell Miss Brown that you and I think that it would be in better taste for us not speak to Mrs Hopkins unless she asks our opinion, and advise her, Miss Brown to write directly to Mrs Hopkins.Aunt Annie gave you my message about Colonel House because I did not have time to write to you until today. I have practically no time to myself except to practise a little, because of my duties to my guests, some of them are most difficult to please, as you know. My evenings are given up entirely to them and the mornings are spent in driving, the afternoons in riding. I am just so glad I don't know what to do that we are going to see you two dears soon and your little home. Are you sure that we won't be too many for the little nest? Aunt Annie says that she would be perfectly willing to go to a hotel. They could dine with you and have breakfast with you—Oh you darling! I am just crazy to see you. It just warms my heart every time I think of arriving in Williamstown and going into your warm(?) little house with its warm welcome. Dear, dear girlie. I love you so much. Please give my realest love to Frank. I love to talk with you two. Often when I hear of some new thing I want to tell you all about it, for I know that you will not laugh even if it is fanciful, but will be ready to find some thing interesting in it or at least to wonder with me. Au revoir my sweet wonderful Sister. I love you devotedly. Wilson, Margaret Woodrow, 1886-1944, “Margaret Woodrow Wilson to Jessie Woodrow Wilson Sayre,” 1914 September 1, WWP17497, Jessie Wilson Sayre Correspondence, Woodrow Wilson Presidential Library & Museum, Staunton, Virginia.